I have to finally admit it there are three mistresses in my life. As when I sleep they haunt me with their siren sounds. I think of them when I am awake and long for them when we are apart. Their beauty captivates the very essence of my being. They are alike, yet unique. Their names are White, Platte and Pere Marquette. The crystal clear waters of the Platte beckon always in my mind. She is a about as wide as the White with riffles and holes. She guards her rainbows and browns and reluctantly relinquishes these treasures to those few who remain faithful to her. This was the first river I fly fished for trout and she became my first love. In earlier years she graced me with views of spring run steelhead but only yielded to my courtship after many pilgrimages. It was here I learned the importance of stealth and concealment, the necessity of gently landing a fly and how patience was more than just a virtue but a skill to be perfected. This is where an airborne ballet was performed by a beaded nymph. Where yards of line carved graceful arcs in the morning mist, where time and space lost all meaning. She kept calling me back and I continued to give in to her wooing. She enticed me one evening with a vicious strike from a brown that shot out from an undercut bank like a missile to intercept my caddis. The fish darted across the river and then came upstream, cleared the water and shot the fly back at me. I could hear the river proclaiming, “Yes, I have some good fish but only for those who spend the time to learn my secrets”. The memory of that lost catch tempted to me to return time and again to recapture that moment as evidenced below. The White ambles, alternating between long expanses of shallow boulder strewn riffles and shorter, narrower runs that tempt the angler to probe her depth. Her tannin colored waters conceals boulders that make fast movements risky. 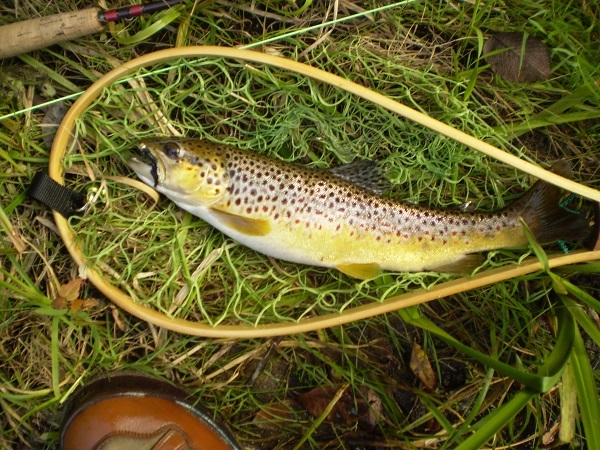 Quick to warm in the spring and slow to cool in the fall making her a haven for brown trout. My first encounters with her left me with a damaged ego and fishless days. I continued to call and tempted her with dries on a cool and windy day in May and she finally yielded a favor. This particular afternoon I could do no wrong as the browns attacked the fly. Although they were on the smallish side it was tantalizing enough to keep me coming back to ply the waters. To my surprise on a nice September day those browns got bigger and attacked my wooly bugger with a vengeance as they feasted in preparation for the upcoming winter. Later that evening I drifted the bead head bugger into a small deep run and felt it come to a sudden abrupt stop. I gave the line tug assuming I had snagged on the bottom when suddenly the snag began move. I was fast into a nice brown. My tenacity was finally handsomely rewarded. The lore of the Pere Marquette River for me is that her fish are legendary. Her reputation makes one feel unworthy to begin to seek her out. She is ever changing, moving swiftly with runs longer and deeper than her sisters. On my first visit she was receptive, yielding two fine salmon to my egg fly but I found that her depth and current intimidated me. I sought her out again after a time but felt uneasy in her presence and I abandoned her. 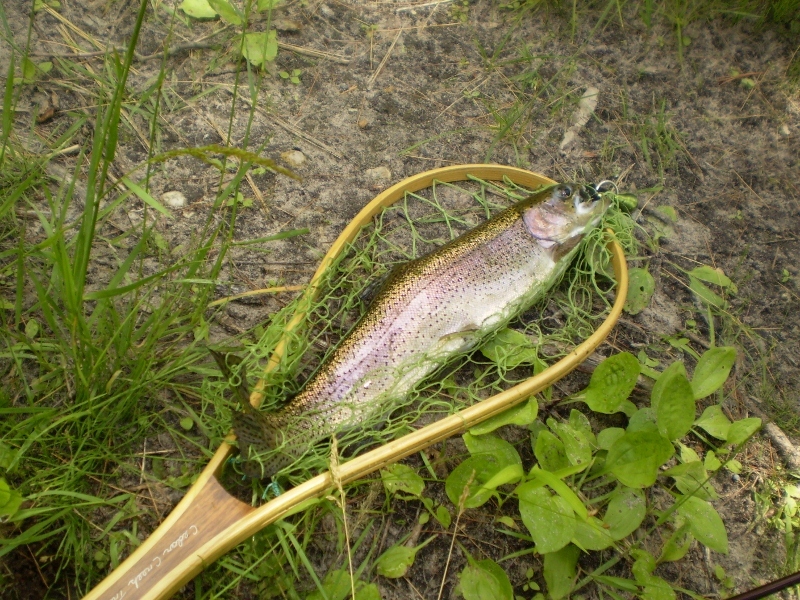 But once again she seduced me and I returned in humble anticipation that she would entice me with browns and rainbows. I placed a black bead head wooly bugger into a deep bankside pool and she granted me a nice rainbow that allowed me to show off in front of a drift boat maneuvered by one of the many river guides. Encouraged by her favors, I sought her out again. This time I arrived at the river confident in my abilities to charm and conquer her, convinced I was her master and she was mine forever… I confidently cast a Dave’s hopper against the bank where it floated on the surface only to catch a snag at the end of the run. I tied on another to have it repeat the same abysmal performance. Rising fish watched my offering pass; the fly ending up on a fallen limb like ornaments on a Christmas tree. I plodded heavy hearted back to my truck and knew this river would always challenge me. These are my first three but there are others that have now entered my life and vie for my attention. 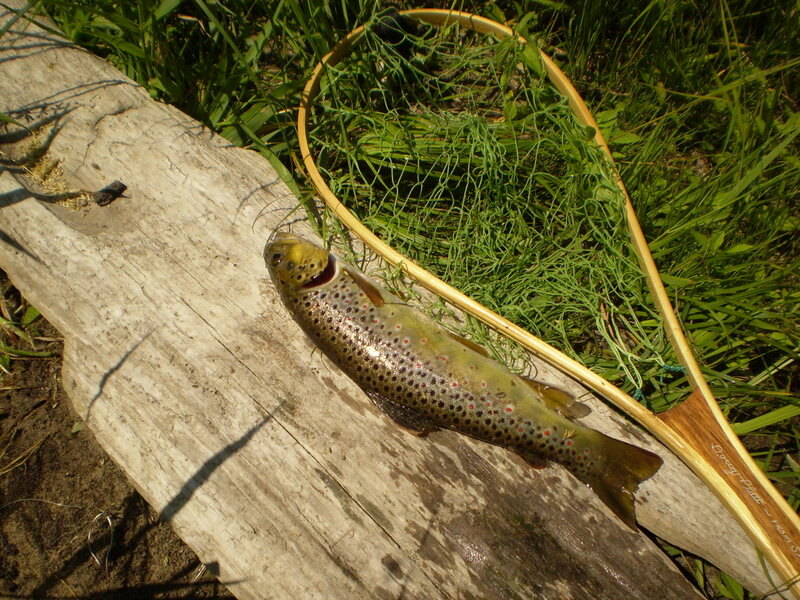 This entry was posted in fishing, fly fishing, musings, Uncategorized and tagged brown trout, fishing, fly fishing, Pere Marquette River, Platte River, rainbow trout, rivers, White River. Bookmark the permalink. Sounds like your three mistresses like you, too. Great informative post.